The Ziggurat (or Great Ziggurat) of Ur (Sumerian: 𒂍𒋼𒅎𒅍 é-temen-ní-gùru "Etemenniguru", meaning "temple whose foundation creates aura") is a Neo-Sumerian ziggurat in what was the city of Ur near Nasiriyah, in present-day Dhi Qar Province, Iraq. The structure was built during the Early Bronze Age (21st century BCE) but had crumbled to ruins by the 6th century BCE of the Neo-Babylonian period, when it was restored by King Nabonidus. Partially reconstructed facade and the access staircase of the ziggurat. The actual remains of the Neo-Babylonian structure can be seen at the top. Its remains were excavated in the 1920s and 1930s by Sir Leonard Woolley. Under Saddam Hussein in the 1980s, they were encased by a partial reconstruction of the façade and the monumental staircase. The Ziggurat of Ur is the best-preserved of those known from Iran and Iraq, besides the ziggurat of Dur Untash (Chogha Zanbil). 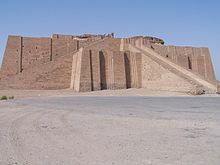 It is one of three well preserved structures of the Neo-Sumerian city of Ur, along with the Royal Mausolea and the Palace of Ur-Nammu (the E-hursag). The ziggurat was built by King Ur-Nammu who dedicated the great ziggurat of Ur in honour of Nanna/Sîn, in approximately the 21st century BCE (short chronology) during the Third Dynasty of Ur. The massive step pyramid measured 64 m (210 ft) in length, 45 m (148 ft) in width and over 30 m (98 ft) in height. The height is speculative, as only the foundations of the Sumerian ziggurat have survived. The ziggurat was a piece in a temple complex that served as an administrative center for the city, and which was a shrine of the moon god Nanna, the patron deity of Ur. The construction of the ziggurat was finished in the 21st century BCE by King Shulgi, who, in order to win the allegiance of cities, proclaimed himself a god. 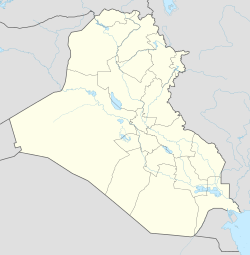 During his 48-year reign, the city of Ur grew to be the capital of a state controlling much of Mesopotamia. Many ziggurats were made by stacking mud-bricks up and using mud to seal them together. King Nabonidus, the last king of the Neo-Babylonian Empire in the 6th century BCE, after "finding little left but the last stage and nothing to guide him as to the monument's original appearance", had it restored in seven stages rather than three. The remains of the ziggurat were first discovered by William Loftus in 1850. The first excavations at the site were conducted by John George Taylor (mistakenly credited as "J. E. Taylor") in the 1850s, leading to the identification of the site as Ur. After World War I, preliminary excavations were performed by Reginald Campbell Thompson and Henry Hall. The site was extensively excavated in the 1920s by Sir Leonard Woolley by appointment of the University Museum of the University of Pennsylvania and the British Museum in the period of 1922 to 1934. The remains of the ziggurat consist of a three-layered solid mass of mud brick faced with burnt bricks set in bitumen. The lowest layer corresponds to the original construction of Ur-Nammu, while the two upper layers are part of the Neo-Babylonian restorations. The façade of the lowest level and the monumental staircase were rebuilt under the orders of Saddam Hussein. The ziggurat was damaged in the Gulf War in 1991 by small arms fire and the structure was shaken by explosions. Four bomb craters can be seen nearby and the walls of the ziggurat are marred by over 400 bullet holes. As of 2008, the site is under the supervision of curator Dief Mohssein Naiif al-Gizzy. ^ Klein, Jacob (1981). Three Šulgi hymns: Sumerian royal hymns glorifying King Šulgi of Ur. Bar-Ilan University Press. p. 162. ISBN 978-965-226-018-5. ^ a b "The Ziggurat of Ur". British Museum. Retrieved 24 November 2017. ^ Heinrich, Ernst (1982). Die Tempel und Heiligtümer im Alten Mesopotamien. Typologie, Morphologie und Geschichte. 1. Berlin: de Gruyter. p. 341. ISBN 9783110085310. ^ Gardner, Helen; Kleiner, Fred S.; Mamiya, Christin J. (2005). Gardner's Art Through the Ages. Thomson Wadsworth. p. 1150. ISBN 9780155050907. ^ Ring, Trudy; Salkin, Rober M.; La Boda, Sharon (1994). International Dictionary of Historic Places: Middle East and Africa. 4. Taylor & Francis. p. 719. ISBN 9781884964039. ^ Boulger, George Simonds (1893). "Loftus, William Kennett" . In Lee, Sidney (ed.). Dictionary of National Biography. 34. London: Smith, Elder & Co. pp. 80–81. ^ Sollberger, E. (1972). "Mr. Taylor in Chaldaea". Anatolian Studies. British Institute at Ankara. 22: 129–139. JSTOR 3642557. ^ Woolley, C. Leonard (1972) . The Ziggurat and its Surroundings. Ur Excavations. 5. Trustees of the Two Museums. ^ Marozzi, Justin (8 August 2016). "Lost cities #1: Babylon – how war almost erased 'mankind's greatest heritage site'". The Guardian. Retrieved 24 November 2017. ^ Handwerk, Brian (21 March 2013). "Iraq War Threatens Ancient Treasures". National Geographic News. Retrieved 24 November 2017. ^ Inati, Shams Constantine (2003). Iraq: Its History, People and Politics. New York: Humanity Books. p. 31. ISBN 9781591020967. ^ "Stock Photo - Mar 01, 2008 - Tallil, Iraq - Curator DIEF MOHSSEIN NAIIF AL-GIZZY shows one of the royal tombs at the Sumerian ruins next to the Ziggurat of Ur. Al-Gizzy is the third". Alamy. ZUMA Press. 1 March 2008. Retrieved 24 November 2017. Woolley, C. Leonard and Moorey, P. R. S., Ur of the Chaldees: Revised and Updated Edition of Sir Leonard Woolley's Excavations at Ur, Cornell University Press (1982). Wikimedia Commons has media related to Great Ziggurat of Ur.